Vascular Tyler’s mission is to promote vascular wellness by providing contemporary, high quality vascular care to the communities they serve, and to treat their patients with dignity, compassion, and exceptional service in a way that honors our creator. 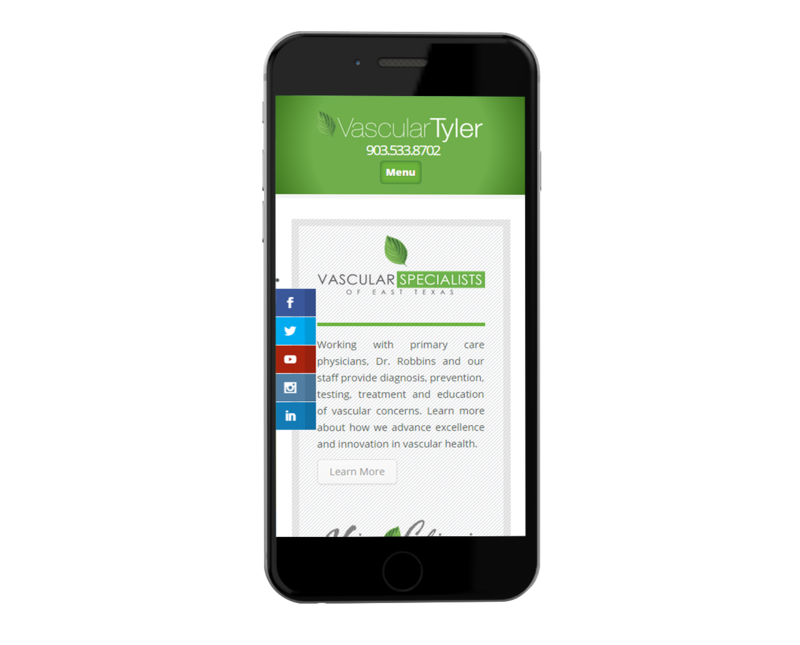 Vascular Tyler’s vision is to become the premier vascular health center in East Texas, providing extensive on site preventative, diagnostic, and therapeutic services and to develop outreach services bringing exceptional vascular care to surrounding communities. VascularTyler has been a long-standing client of ours and we’re grateful to have worked on another project for such a wonderful company. They first approached us with this project looking to refresh their website with a modern contemporary look that matches the personality of their company. Their old website was very small and boxed in. Our first step was to create full screen sections and implement generous, but appropriate white-space. Using the right amount of white space, releases visual tension and allows your eyes to comfortably scan across the page. Using a clean, vibrant color scheme, consistent with their other branding materials, we were able to create a clean, professional design, while maintaining the stylish brand consistent with VascularTyler. VascularTyler maintains a stylish and modern vibe which sets them apart from other vascular health clinics in their area. Their new website, is no exception. Perhaps the most crucial step in any website today is designing responsively. We make every effort necessary to ensure a consistent user experience across all major browsers and devices.